Tourmaline is famed for occurring in every color of the spectrum. But some tourmaline colors are actually very rare, especially blue. The blue tourmaline that has attracted the most attention is the super rare paraiba variety that was first discovered in Brazil in 1989, and then later in Nigeria and Mozambique. These gems, colored by copper, have an unusual neon-like quality that is prized by collectors. But all blue tourmaline is rare, even the non-copper-bearing specimens. Bluish tourmalines -- often referred to under the name indicolite -- are colored by iron. A pure blue is extremely rare, and most indicolites will have some green secondary hue. A teal or blue-green color would be most typical. The purer blues will tend to be found only in small sizes, while larger stones will tend to have a stronger green component. We have seen fine blue-green tourmaline from Nigeria, Mozambique, Brazil and Afghanistan. But this Namibian material is among the most beautiful and vivid we've seen. We feature some stunning examples in this month's Notable Gems. This month we feature new aquisitions in Blue and Blue Green Tourmaline, including a number of rare gems from the new deposit in Namibia. Click on any photo to view the details for the gem. A rare pure blue Tourmaline from the new find in Namibia. Beautiful crystal and very clean with a lovely blue color, very unusual in tourmaline. This is a bright stone, full of life, with excellent brilliance. Guaranteed natural and untreated. A superb large bicolor Blue Green Tourmaline from the new deposit in Nambia. This is an extraordinarily vivid gem, displaying a bright blue hue on the table and a vibrant green on the ends. This gem is perfectly clean and precision cut in a square octagon. This is a special gem that will set up beautifully in your jewelry design. Guaranteed natural and untreated. A splendid Teal Blue Tourmaline from Namibia. This fine gem has wonderful color consistency, perfect clarity and has been precision cut in a square octagon, perfect for a gorgeous ring. Guaranteed natural and untreated. A very large Blue Tourmaline cabochon from Brazil. A fine teal blue color with excellent translucency, in an impressive size with a high dome. This will set up beautifully in your custom ring or pendant design. Guaranteed natural and untreated. A fine Blue Green Tourmaline from the new find in Namibia, a perfect size for an important ring! This new Namibian material is beautiful crystal and is completely clean with a lovely teal blue, fashioned in a well-proportioned cushion cut. This is a bright stone, full of life, with excellent brilliance. Guaranteed natural and untreated. A stunning large bicolor Blue Green Tourmaline from the new deposit in Nambia. This is an extraordinarily vivid gem, displaying a bright blue hue on the table and a vibrant green on the ends. This gem has wonderful crystal, with perfect transparency and clarity. This is a special gem that will be an important addition to any collection. Guaranteed natural and untreated. 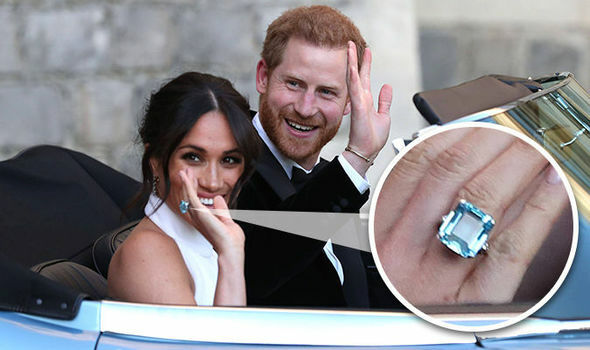 The British royal family's love affair with colored gemstones was in evidence at the recently wedding of Prince Harry with the American actress, Meghan Markle, now known as the Duchess of Sussex. Following her wedding, the new Duchess set off for the evening reception in a white Stella McCartney gown that she paired with a famous Aquamarine ring that once belonged to Prince Harry's mother, Princess Diana. Set in 24-carat yellow gold, the emerald-cut Aquamarine, perhaps about 30 carats, is surrounded by smaller diamonds. The Asprey ring is believed to have been commissioned by Diana after her divorce from Prince Charles and was designed to match a previously existing aquamarine and pearl bracelet. This is an important topic, and one that is often misunderstood, even by some experienced buyers. A window is an effect of suboptimal cutting -- less than ideal depth and/or cutting angles -- that affects the brilliance of a faceted gem. To determine if a gem is windowed, look down at the gem through the table, at a 90 degree angle. If the gem has a window you will see an area of reduced color in the center of the stone, with a darker rim around the edge. You can also place a page of text below the gem and see if the text is visible through the center of the gem. Windowing is a matter of degree -- a gem may have no window, a very slight window, or a large window. Large windows should always be avoided, since they will not perform well when set. Gems with very slight windows, on the other hand, usually display no window at all once set in jewelry; the window, as we say, "closes up." Some gems are windowed because the gem was cut to preserve weight or because the rough stone was shallow or because the cutter wanted to lighten the color of dark material. Some buyers are happy to buy a windowed gem since these gems usually have a large face for the carat weight and sell for a lower cost per carat. It is our policy only to sell well cut gemstones. If we acquire some high quality material which displays a window we will always recut it before offering it for sale. It means that the per carat cost will be higher, but our customer can always have confidence in the brilliance of the gems we offer for sale.